When I was growing up, Hyde Park was eclectic, it was very different, it was very diverse…My parents divorced, my father moved down the street. We lived in Madison Park all my life, so we moved from Madison Park to 52nd and Drexel, [to stay] with my dad…I swam in the lake all my life, swam at the Point all my life. I would wake up at six in the morning with my friends, the Siglers, and we would wake up and hit the lake, and we would swim from buoy to buoy to buoy. Later on we became junior lifeguards, and the other girls became serious lifeguards. We had a great, great life. We had a lot of different [stores]…We had a Vogue Fabric, they had sewing classes that they offered us kids, but you always had wonderful restaurants, cute jewelry stores, a lot of ma-and-pa stores. Some survived, some didn’t. Some moved elsewhere, some closed for good, but it was always a ma-and-pa situation. I think that it’s important to keep that. You bring in these huge corporations, like Macy’s and Target and things like that, into the area? I’m not for that, unless it’s in an area like this [North Kenwood] and doesn’t conflict with ma-and-pa stores that are selling the same items. As a Hyde Parker of fifty years, I don’t think I’ve seen this much development in my lifetime…I think that a lot of the buildings that they have built on 53rd Street…they should have considered putting those types of buildings in the Northern Kenwood area. That’s been desolate for years. And I think it’s unfair. Here we are, 2016, and it’s still underdeveloped. When I was growing up I didn’t cross Cottage Grove––it was too rough. The number one leader of the gangs was Jeff Fort––and Jeff Fort’s “fort” was where my Currency Exchange used to be [39th and Cottage Grove]…I think that because of Jeff Fort at that time––in the 1980s into the 1990s––I think that had a lot to do with the separation [between Hyde Park and Kenwood]. And they call [Kenwood] the “low end,” the numbers being low…but at that time probably they were calling it the “low end” because…it was just like a war zone at one point over here. I’ve watched the gentrification take place: I was there when the [Robert Taylor] projects [were] up, and I was there, and I’m still there while the projects are down, and where they have developed beautiful homes as well as low-income apartments, which was great. They didn’t disperse all of them [former Robert Taylor residents]. But a lot of them were dispersed throughout the different suburbs. It’s been an interesting transformation. It’s still a fantastic community. You know, I welcome Hyde Park being built up—I welcome that because I love diversity, I love everybody, I was raised that way…I think togetherness is where we all need to be at this point in our lives. Change is good. To some degree. As long as we all benefit. Lisa Pilot Livingston was born and raised in Hyde Park. One of Chicago’s premier African-American female experts in the construction and development industry, Lisa is currently the CEO of LCP Management Inc, and has built in Hyde Park, Kenwood, and Bronzeville. She is a graduate of Columbia College and now lives in Kenwood with her husband and daughter. 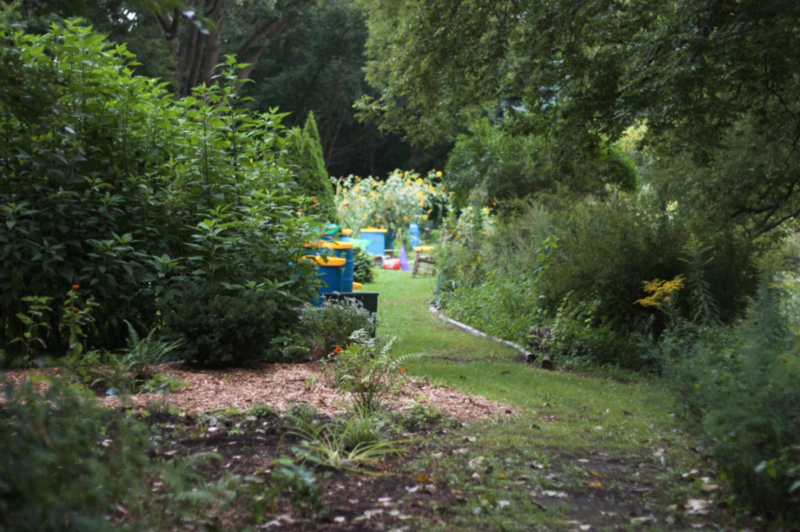 On an unlikely tract of land sandwiched between the Metra tracks and Cornell Drive, a community garden hums with life. Bees and butterflies flit between a miscellany of plants, including the towering native prairie plants leading up to the garden, and birds sing in the branches overhead. It’s enough to make you forget that you’re within the city limits. Before Cornell Oasis had a name, it was part of a vast sprawl of green that extended from the Metra tracks (then the Illinois Central Railroad) east, uninterrupted, out to the Outer Drive. The area was home to a network of small “victory gardens,” produce gardens designed to boost local food supply and public morale during World War II; the practice seems to have grown a lasting community of gardeners. But the Oasis claims its origin was later, in 1952, the year in which resident Gerda Schild began cultivating her personal garden, which later would become known throughout Hyde Park for being home to a rich assortment of butterflies and insects. A patchwork of gardens sprung up around hers in the following decades, and the Cornell Oasis was born. The Oasis would see its original boundaries pushed back substantially over time, first when Cornell Drive was extended from 49th Street to 47th Street, cutting the Oasis off from the rest of Burnham Park, and then later, when a developer bought the land that made up the north end of the garden (then owned by Illinois Central Railroad) to build a sixty-unit residential complex. Although some residents voiced their opposition to the development loudly (or in the case of Schild, with a lawsuit), the homes were ultimately built, and as a result the Oasis is quite smaller today than it was in earlier years. But what the garden lacks in size, it makes up for in diversity of ecosystem and dedication of its gardeners––two things which have been constants from the beginning. The current gardener-in-chief, Hal Cohen, speaks eagerly of the Oasis’s commitment to continuing Schild’s legacy as a cultivator of both land and insect life. He demonstrated just how deep this sentiment runs as he fretted over how to most compassionately kill the cabbageworms he found gnawing at his lettuce heads as we walked the grounds one morning. The Hyde Park-Kenwood area has historically been a hotspot for artisans, artists, and makers of all kinds. Recent years, however, have seen the shuttering of two beloved institutions, the long-lived Artisans 21 Cooperative and the Southside Hub of Production, leaving some to question the community’s support of local art and craftsmanship. In the face of this, the local community of artisans has shown itself to be as robust as ever, and it’s worth giving a nod to two (relatively) new institutions on 53rd Street that are helping local artistans continue to thrive: The Silver Room and the Hyde Park Handmade Bazaar. 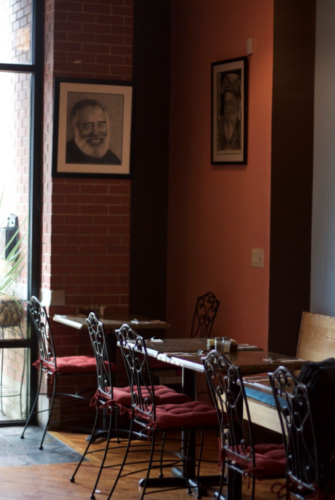 The Silver Room, though a recent addition to Hyde Park, is not itself new; Eric Williams had run his shop in Wicker Park for twelve years before moving it down to Hyde Park. Although not everything he sells is locally made––“sometimes you just want something different,” explains Jenny, a Silver Room employee, pointing at a handsome, grey felt bag made in Argentina––a good chunk of the accessories and apparel he sells are local brands, like N’Torious Creations, Fanta Celah, and BLKLST. After hours, too, he finds ways to involve local makers of all levels; The Silver Room hosts local vendors at the annual Silver Room Block Party and teaches a workshop in beginner jewelry-making and metalsmithing to boot. For less established artisans, there is the Hyde Park Handmade Bazaar, which is a little over two years old now. Its manager, Vera Videnovich, herself a Hyde Park-dwelling knitter, writer, and farmer, likes to think of the bazaar as a “stepping-stone” for artisans. “I didn’t want the market to be just a one-off event, but a showcase of what’s already there,” she emphasizes. Videnovich previously coordinated the Empty Bottle Farmers Market and assisted with the Handmade Market at the Empty Bottle, in West Town. When the Promontory approached her about working on a similar project in their event space, she jumped on board straightaway. The market has thrived since then; she now receives around four times more applications per bazaar than the number of spaces for vendors (thirty-three). Gaona says that the Silver Room Sound System Block Party and Hyde Park Handmade have been his most successful markets in Chicago. “As entrepreneurs we are always connecting with each other and learning how to grow our business and the Hyde Park Handmade Market gives us a place to do that, and is growing with us,” he says. You call the LSTC building bulky and uninviting. But it is an award-winning building, and a flow-through space. Note how the walls are glass! It does not wall people out, like the new U of C form across the street. In good weather, you can eat outside on that quad. And over the years, many Hyde Park organizations have met in the building. You may have just discovered it, but workers from the Child Care Society and Regenstein Library have been eating there for years. But thanks for a great review!